If not handled properly the Mekita fiber this sander can be the most dangerous tool we have in our arsenal. The Makita 5 in. Disc Sander has a powerful 4.2 Amp motor that deliver speeds up to 4,500 RPM . 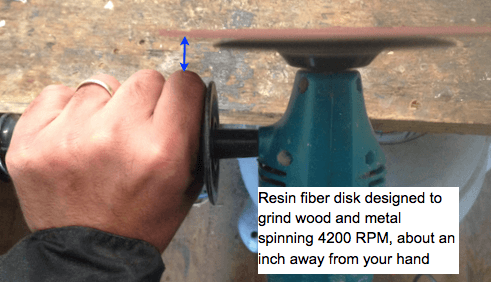 the fiber disks we use with this machine are manufactured to grind wood and metal. As the image below shows, this spinning disk comes very close to your hand. Also when sending a deck, the spinning disk comes very close to your legs.